After much anticipation, the Southern Pacific tracks complete a route from California to the small desert outpost of Tucson. This means cheaper goods to local residents and faster transportation in a relatively short time. The railroad irrevocably changes Tucson forever. The first train arrives about an hour earlier than expected at 11 a.m. on March 20, 1880. 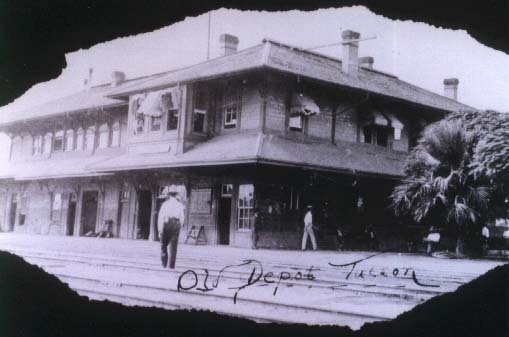 A picture of the first wooden depot built by the Southern Pacific. It was demolished and replaced by today’s depot in the early 1900’s.